3 Ring Binder Cover in ICE CREAM FLAVORS Stretch, Fabric Binder Cover for 2-3 inch Wide Binder, Recipe Binder Cover by SEWING the ABCs at Nicky's Blog. Hurry! Limited time offer. Offer valid only while supplies last. HANDMADE S-T-R-E-T-C-H Binder Cover for 2''-3'' Wide 3 Ring Binder in ICE CREAM FLAVORS Fabric. The background on this fabric is dark charcoal grey. 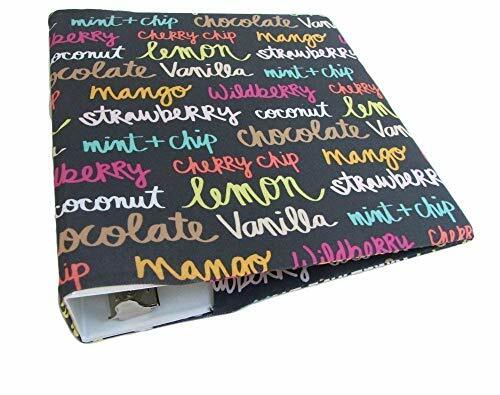 HANDMADE S-T-R-E-T-C-H Binder Cover for 2"-3" Wide 3 Ring Binder in ICE CREAM FLAVORS Fabric. The background on this fabric is dark charcoal grey. TRANSFORM your everyday FULL-SIZE Standard Ring or D-Ring Binder with FABRIC. Enjoy the beauty and feel of fabric . . . Range of fit makes your life EASY. CREATE . . . A full-size planner, photo album, recipe binder, special occasion binder, special collection, teacher or coach gift, Christmas gift . . . you imagine it. BINDER FIT . . . measure the width of the spine. For example, my 1" Binder actually measures 1.5" Wide on the spine so I would select the 1"-1.5" Binder Cover Size. - Dimensions listed are pre-stretched--measured when folded in half like a book. - Listing is for ONE Binder Cover. QUESTIONS . . . about fit or need a custom size? MORE Sizes, Fabrics, and Binder Accessories available in my SEWING the ABCs Storefront on Amazon. GIFT PURCHASE? . . . Select from 8 Gift Message Cards. (See Photo). Standard packaging includes tissue paper wrap tied with fabric remnant strips . . . Holiday packages tied with Holiday color strips.